The participants will intensively work with flutist Natalia Gerakis, individually and in group, on technical and musical issues, on the realization of one's own targets, the preparation of concerts, competitions and auditions. The final concert, taking place at the end of the seminar cycle, will provide the participants with the opportunity to perform in public the works they have developped during the course. Apart from the ordinary flute repertory, the participants will also work on compositions by Claude Debussy, on the occasion of his 150th birthday, as well as compositions for flute by Minas Borboudakis. Piano accompaniment by Loukas Georgas. The seminar will begin on Friday 14.09.2012 at 18.00 with the concert – presentation entitled "Syrinx & Aeolus" by the lecturers Natalia Gerakis and Minas Borboudakis. After the opening concert, participating flutists will work with composer Minas Borboudakis on his compositions for flute. Furthermore, on 14.09.2012 the flutists will have the opportunity to attend the master class for composition held by Minas Borboudakis (10-14.09.12). Following the end of the seminar, each participant of the flute seminar will perform a music piece in the scheduled concert taking place at the ABOUT Cultural Venue. 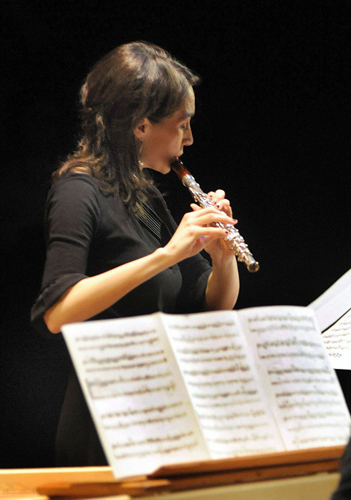 Natalia Gerakis is considered one of the most accomplished flutists in Greece today. Both Stuttgart -and Athens-based, she has performed as a soloist, chamber musician and orchestra player at major halls and festivals throughout Germany and Greece. Furthermore, concerts and tours have brought her to numerous European and Mediterranean countries. She has been principal flutist of the Thessaloniki State Symphony Orchestra, has performed with the Athens State Orchestra, the Mikis Theodorakis Popular Orchestra, the Wuerttembergisches Kammerorchester Heilbronn and has collaborated with the Chamber Theater of the Stuttgart State Opera Haus. She completed her studies in Paris with Genevieve Amar and Vicens Prats at the Nadia & Lili Boulanger Conservatoire in Paris, from where she graduated with the "1er Prix de la Ville de Paris" and at the State Music Academy in Stuttgart under Prof. Jean-Claude Gerard, on a scholarship of the Greek State. Currently Natalia Gerakis is a sought-after tutor of international music courses. She particularly enjoys working for concentrated short periods of time with young flutists, helping them towards achieving their own goals (Internationaler Arbeitskreis für Musik /Germany, Springiersbacher Meisterkurse /Germany, Adams European Flute Center /Holland, International Forum for Flute und Piano / Luxembourg). For Natalia Gerakis music is a path towards emotional and spiritual advancement and communication. Those interested in participating in the course should apply by e-mail at meisterkurse@camerata.eu.